Something different for today – a book review, the first of a three coming over the next week or so. This one is close to my heart combining history, colour and textiles. 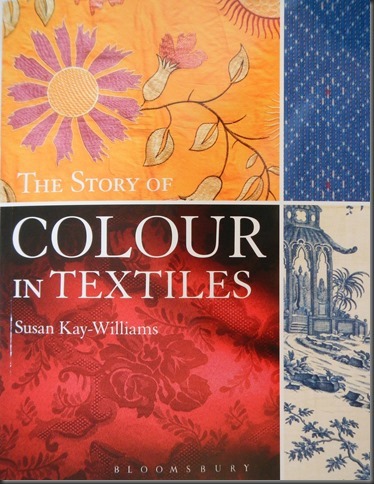 Colour in Textiles by Susan Kay-Williams (Bloomsbury Press, 2013) gives an introductory overview of natural and synthetic dyestuffs over time with lots of interesting facts along the way. 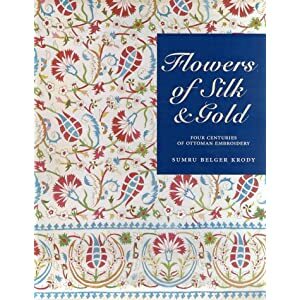 It’s set out in chronological order, starting with “Fragments and Glimpses; dyes from prehistory” and carries out a broad survey of how and why people coloured textiles – mainly in Europe. 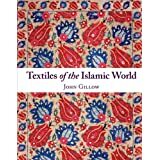 After discussing madder, indigo and (roman) purple the second chapter moves into the Dark Ages and a discussion of the influences of Christianity and Islam on textiles and trade. Chapter three moves to the Middle Ages and discusses the influences of heraldry, the crusades and the rise of blue, yellow and black dyes. The book is full of interesting facts such as the effects of the sumptuary laws across Europe, which saw the rise of black dyes (notoriously difficult). Black became favoured by the merchant classes as it projected an air of status, whilst still keeping the wearer within the law. 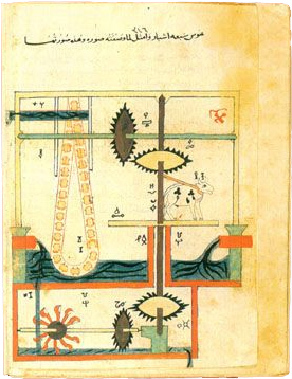 Black was achieved by a laborious under dyeing with madder and overdyeing with tannins such as gall nuts. 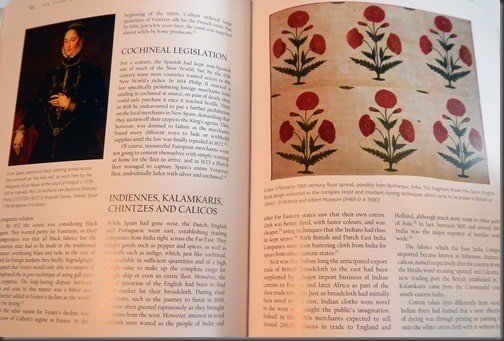 Chapter six discusses the New World dyestuffs – mainly the introduction of cochineal. The overview of the history of dyeing continues into the C16th and C17th when dyeing became more scientific leading to the introduction synthetic dyes such as Turkey Red – which, although it had up to 30 stages, was a valuable red dye because it was so colourfast. There are fascinating snippets of information – Queen Victoria for example, wore a new mauve colour to a wedding and set the fashion for 1859-61. The final chapter looks at the major dye developments during the C20th and C21st and the impact of world wars on supplies and trade. 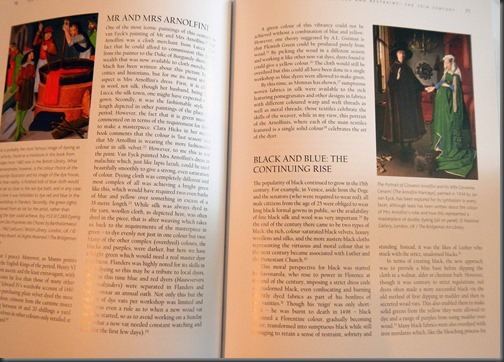 The book ends with a discussion of the revival of natural dyeing by todays craftspeople. 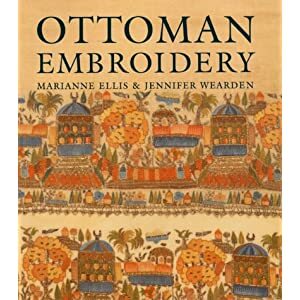 Its a very easy to read book, a story more than a textbook and a valuable addition to the library of any dyer, textile artist, historian or crafter. Bit rushed for time this week with studying and building work in the house. So I’ll point you in the direction of a great introduction here. Here are some images and some links for you to follow. I’ve tried to give you a very quick insight into how the art developed over time. At the end of each week we are asked to select a favourite item from the many, varied selection we are asked to look at. Mine for this last week is from the Adventures of Hamza. With tales of legendary hero’s and … well, adventures! The colours are so beautiful and fresh and the detail is exquisite. 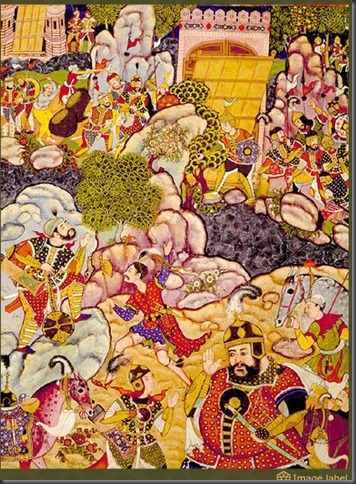 Just finished studying Islamic ceramics and now I understand the process of creating lusterware and the differences between stone paste and earthenware, the influences of the Chinese arts via the silk route and the Mongol invaders and also the amazing inventiveness of the Islamic artists in both copying and creating new ideas. Here are just a few of my favourites for you. If you are near Oxford consider a visit to the Ashmolean Museum or see more on their collection here. 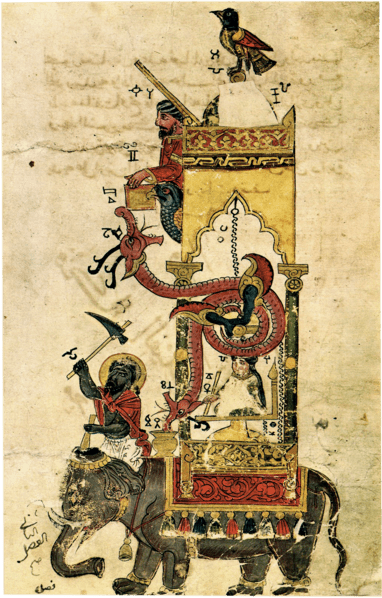 The V&A has as online reading list for ceramics and glass and more dangerously I went on to discover an online reading list for Islamic textiles and dress! Eeekkk!!! And back to ceramics, there is a great collection in Stoke-on-Trent, you can see online here. No doubt used for inspiration for the UK market. 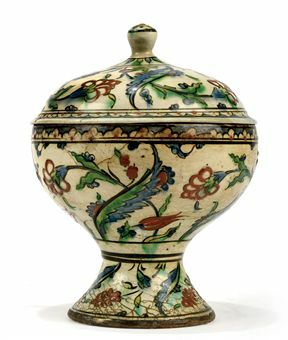 This C17th covered bowl was sold at Christies in 2009 for £17,000 from the Ismail Merchant collection (as in Merchant – Ivory films, some of my all time favourites). You can spend an hour browsing this wonderful collection here.